Staff File Photo by John Rawlston The Blue Bird Bus Corp. announced today that the LaFayette, Ga., plant will shut down Aug. 30, putting about 350 people out of work. With a 9 percent jobless rate, the loss of one of Walker County's biggest employers is a blow, Commissioner Bebe Heiskell said after learning that the Blue Bird plant in LaFayette will shut down Aug. 30. "It's very upsetting. We had a lot going for us, and I was very encouraged about our progress in bringing in business and industry," Mrs. Heiskell said Thursday. Blue Bird officials told plant workers Thursday that the plant's operations will be moved to the company's Fort Valley, Ga., headquarters. About 350 local jobs will be lost, company officials said. "This was a difficult decision, and one not arrived at without significant deliberation," Blue Bird President and CEO Greg Bennett said in a news release from Fort Valley on Thursday afternoon. He said the national recession has taken a toll on the school bus industry. The company will improve efficiency by centralizing all its operations, technical staff and services, Mr. Bennett said. Blue Bird is Walker County's fourth-largest employer, after Roper Corp., the county department of education and Shaw Industries, according to information from the Walker County Chamber of Commerce and the Joint Development Authority. The Georgia Department of Labor reported that 2,833 Walker Countians, or 9 percent, were jobless in May, down from 10.4 percent in May 2009. 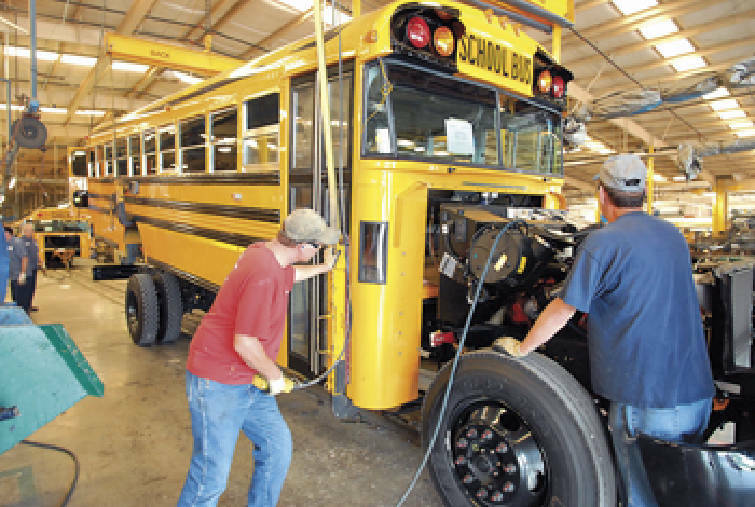 The bus maker has operated its LaFayette plant since 1988. Company spokesman Michael McCurdy said in the news release that the decision to consolidate should not reflect poorly on local workers. "The employees and management at Blue Bird North Georgia have been recognized for producing a high-quality school bus, and we thank them for their years of dedication," Mr. McCurdy said. Workers will receive severance pay and unemployment benefits, and the company will work with the Georgia Department of Labor to help them find new jobs, the release stated. Mrs. Heiskell said her administration will do all it can, too. "We're working very hard to find new positions for the people that are going to need jobs very soon," she said. Business owner Mamdrani Noorulla, whose SNR Groceries is less than a mile from the Blue Bird plant, said the closure will hit him, too. He said he learned the news from company employees as they dropped by his convenience store. "It was mega sad," he said. Mr. Noorulla, who bought the store and grill only six months ago, said he'll lose money from the sale of diesel fuel because Blue Bird brings its buses to his pumps to tank up. And then there's the cash employees spend. "They come while they're going to work in the morning, they come for breakfast. At lunchtime they come for lunch," he said. "They buy some groceries here, and they go home. And they buy gas." Correspondent Timothy Bradfield contributed to this story.